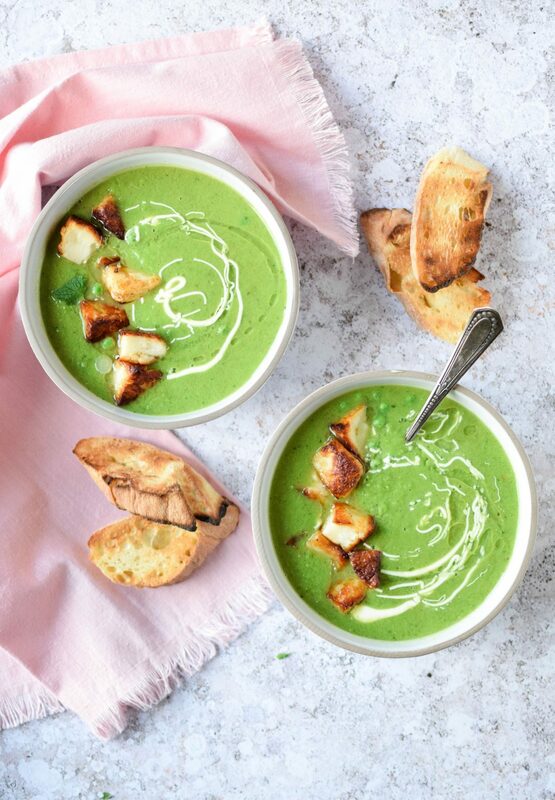 Pea and mint soup is typically a Summer soup, bright and cheerful enough to match the weather. Thanks to the freezer and a bag of frozen peas this soup is just as delicious in the colder months. Packed full of goodness, it’s the perfect vitamin boost for a dreary day. Add in some fried halloumi croutons and we’re onto a winner. Normally when the weather turns colder I find myself craving comfort food. Toad in the hole with lashings of onion gravy, or a traditional mince and dumplings. Man, you can’t beat it. Sometimes, however, I need something a bit brighter to cheer up a miserable day. That’s where this pea and mint soup comes into play. It can be on the table in less than 30 minutes and you’ll have plenty left over for work tomorrow. Now, I don’t know about you but I absolutely love halloumi. That firm, squeaky texture, the deep salty flavour, I could happily eat it as a side dish to any meal. Who would have thought it would make cracking croutons? I can see the vast majority of my future soups coming along with a side of halloumi croutons from now on. It just makes sense to me, I’m sure you understand. Melt the butter in a pan. Add the onion, garlic and a few sprigs of mint. Cook for 5 minutes, stirring frequently. Add the stock and three-quarters of the frozen peas, cover and bring to the boil. Simmer for 5 minutes before liquidising with a handheld blender or leave to cool for 10 minutes and transfer to a table top blender. To make the halloumi croutons heat 1tbsp oil in a large frying pan. Once hot add the halloumi cubes and fry, turning frequently, until golden. Transfer to a plate lined with a few sheets of kitchen towels. Reheat the soup, stirring in the rest of the bag of peas. Season with salt and black pepper. Serve the soup piping hot, adding a swirl of crème fraîche, mint leaves, the halloumi croutons and a drizzle of oil to each serving. This soup can easily be made vegan by leaving out the halloumi croutons and using a vegan crème fraîche substitute. Want to make it even more decadent, add a hand-full of shredded ham hock to the bottom of each bowl before pouring in the soup. 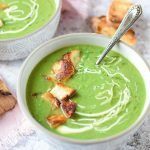 I don’t think I have ever actually tried a pea and mint soup — I do love a good soup though! 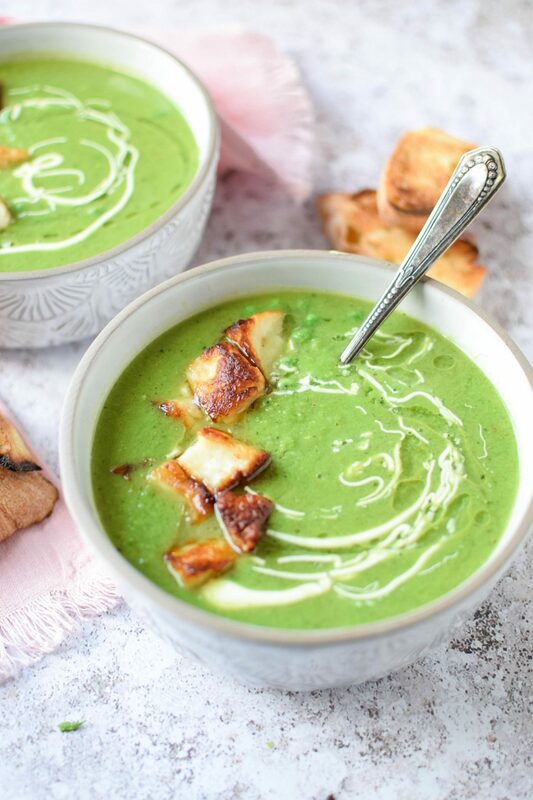 My favourite soup but you’ve just taken it up to a whole new level with Halloumi Croutons…. wow! It looks deliciously fresh and vibrant. I do love a good soup, especially in the colder months, I must try this one. This looks so good and I love the idea of using halloumi as a crouton, genius! This sounds absolutely delicious! I love the addition of halloumi croutons! Yum! Pea and mint soup made right is amazing and this looks great. I’m a massive hallomi fan and they look amazing. I love halloumi but I’ve never thought of using it in this way before – sounds delicious! The soup sounded delicious enough on it’s own, but I absolutely LOVE halloumi so adding the croutons sounds like an amazing idea! This looks really tasty. I’m not a big fan of soup, but I haven’t really tasted many homemade ones and I’d really like to. Halloumi croutons sound epic. That soup looks so hearty and delicious and I adore your photo styling. Halloumi bites sound amazing! I’m not sure I’ve ever had pea soup. It sounds so easy to make though… and with frozen peas – we’ll – there’s no excuse not to try it ?